The LG G2 VS980 Verizon Wireless Manual is instruction ebook which contains many tutorial especially about how to operate the phone. 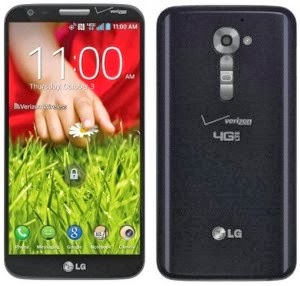 The LG G2 VS980 Verizon is powered by 2.26 GHz quad core processor with Qualcomm MSM8974 Snapdragon 800 Adreno 330 chipset. It's installed Android 4.2.2 Jelly Bean platform. The phone available 32 GB internal memory and 2 GB of RAM. IT has 5.2 inches HD IPS LCD screen display with 1920 x 1080 pixels resolution and Corning Gorilla Glass 2 protection. Other specs and features of this phone such as measuring 138.4 x 70.8 x 9.1 mm, equipped with 13 megapixel rear camera, , 2.1 megapixel front facing camera, and also powered by Li-Po 3000 mAH battery capacity. The LG G2 VS980 Verizon Wireless User Manual has 235 pages (5.3 MB). It's available in english and spanish language. The manual very important for owner of this phone because provide many reference information such as learn phone basic operations, Charging the Phone, Turning the Phone On and Off, Getting to Know the Home Screen, Hardware key control mode, Working with Menus, Locking the Screen, Connecting to Wi-Fi Networks, SmartShare and USB connection, using Chrome and making phone calls, using camera, video editor, play store, using applications like quick memo, Qslide, QuickTranslator, using maps, POLARIS Office 5, phone settings guide, safety, specifications, and FAQ (includes troubleshooting). Is it possible to set up one-way-sync with Gmail? Is it possible to synchronize all of the Email folders? Is it possible to transfer Contacts dat from a feature phone to an Android™ phone? What happens when I access another application while writing an email? Is there a file size limitation for when I want to use an .MP3 file as a ringtone? Is it possible to synchronize my contacts from all of my email accounts? Why don't my phone numbers with Wait and Pause work? What should I do if I forget my Unlock Pattern? Which languages are supported when using Play Store? My screen turns off after only 30 seconds. When Wi-Fi and 4G are both available, which service will my phone use? Can I use music files for my ringtones? What is the maximum amount of time my phone’s battery will last before I need to recharge it? How can I perform a factory reset if I can’t access the phone’s Settings menu?